So-called “Remastered” editions of classic games have been very much the in thing for the last few years, this being a relatively low-effort way to get money for old rope. That the remasters often turn out to somehow be worse than the originals, either through technical issues (Age Of Empires 2, Homeworld) or because they completely miss the point of what made the original games great (the Monkey Island remasters) hasn’t at all dissuaded developers from their efforts to tap directly into gamers’ nostalgia glands, and so now it is Day Of The Tentacle’s turn to be disinterred, spruced up a little bit and rudely thrust back into the limelight. This is a potentially dangerous thing for Double Fine to be doing for several reasons. The first, and biggest, is that previous remasters of classic Lucasarts adventure games have sucked, or at least weren’t very good. 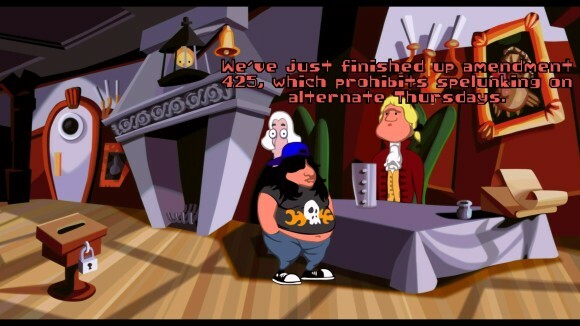 The first Monkey Island remaster was a disaster, with art that was uglier than the twenty year-old original and voice actors who (Dominic Armato aside) had absolutely no grasp of that exotic concept of “comic timing”, which is something of an issue when you’re making a comedy adventure game about pirates. The second Monkey Island remaster was something of an improvement on the art front but also carried over many of the issues from the first one, with its main legacy being a soundtrack that, while not exactly better than the original, could at least sit alongside it as a sort of alternative mix. Finally you have Grim Fandango, which took a much wiser approach of mostly leaving the original assets untouched save for touching up the graphics and the interface a little, but which was hamstrung by Grim Fandango not being a very good adventure game1. It’s not exactly an area in which developers have a strong track record of success. 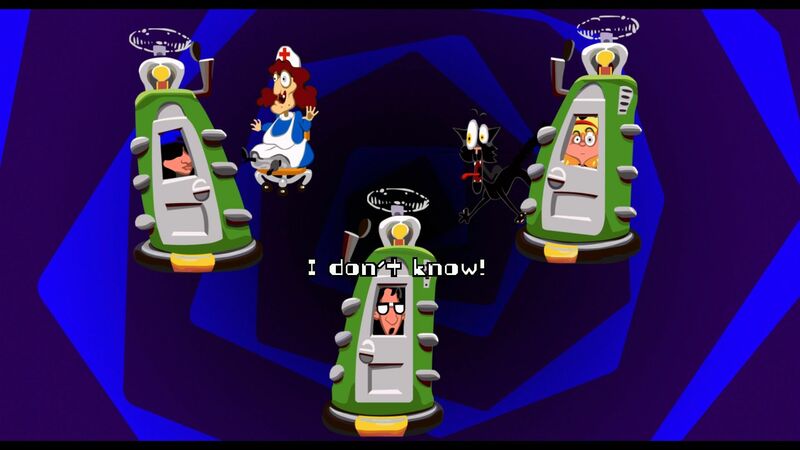 Then you’ve got the second reason, which I appreciate is going to be rather specific to me: I think Day Of The Tentacle is the best adventure game ever made to the point where I do literally have the entire game memorised (save for bits and pieces of Laverne’s era), and so I’m going to give very short shrift to any inadequacies thrown up by ill-advised changes that are part of a remaster. Fortunately Double Fine have used the same light touch here that they did with the Grim Fandango remaster. They’re helped along significantly by DOTT already being fully-voiced back in 1993 (with comic timing thankfully intact) so they don’t have to record new dialogue for a whole game and can avoid the potential pitfalls that the Monkey Island remasters blundered into so enthusiastically; all they have to do there is sharpen up the audio. The music must have been a bit trickier for them as they’ve redone all of it; however it’s been done so that it preserves the spirit of the original MIDI tracks (in other words they’ve not gone and brought in a full orchestra to do it just because they can) and also — crucially — in a way that appears to be compatible with the dynamic iMUSE behaviour of classic Lucasarts titles, where the music would segue seamlessly from one track to another as you transitioned from screen to screen. This is something that the Monkey Island remasters also fell down quite badly on, as even MI2’s soundtrack couldn’t quite replicate that smooth transition. iMUSE was very subtle, but it was an absolutely critical element of the irreplaceable sense of atmosphere that the Lucasarts adventures games all shared, and I’m extremely happy that DOTT Remastered gets it right. The visuals are potentially a thornier area to tackle. “All” Double Fine have done here is smooth up all of those pixelated edges on the original art, make the game widescreen and relegate the inventory to a pop-up tab so that it’s not taking up the the bottom third of the screen. The additional art required to make the game widescreen (in some places they’ve had to draw extra bits on each side of the screen to make it fit properly) are so seamless I didn’t even notice them, so no issues there. Banishing the inventory to a pop-up tab isn’t the most elegant thing they could have done — admittedly I’m struggling to think of a better way of doing it so I feel a bit awkward making this criticism, but it did feel rather hamhanded to have to manually bring up the inventory every time I wanted to use an item — but Double Fine have at least done what the MI remasters didn’t and preserved the original inventory structure and icons, ensuring that visual jokes like the ever-evolving state of the hamster make it across into the remaster intact. If you don’t like this then they’ve provided the option to play the game with the new art but using the old verb-based UI, although you have to sacrifice the widescreen visuals in order to do this. Still, it’s a pretty admirable attempt to provide the best of both worlds. Those smoothed edges, though. I’m in two minds about this. On the one hand I feel like most attempts to improve visuals in remastered games are driven by a misguided assumption that older art automatically equals worse art thanks to the technical restrictions of computers at the time. 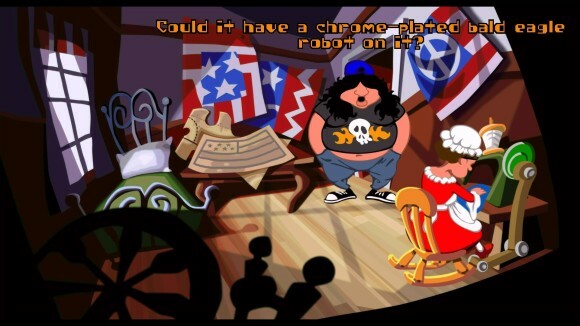 This isn’t always true, and for the Lucasarts adventures it’s particularly untrue; those games had pixel art that hinted at what wasn’t there in a masterful way, and neither of the Monkey Island remasters managed to better the pixelated renderings of Steve Purcell’s original hand-drawn backgrounds despite having a twenty year advantage. Talent tends to shine through no matter what the medium, and so redoing art is only a good idea if you’re sure the studio doing the remaster has an artist on staff who is that talented2. 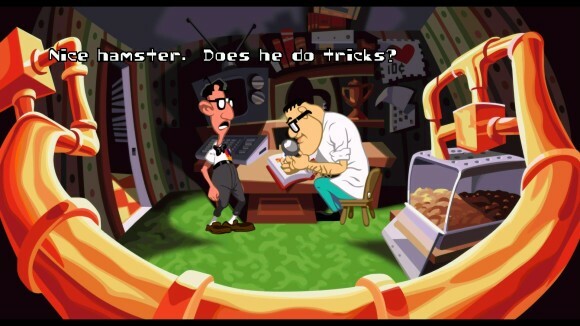 On the other hand the stylised art of DOTT is clearly supposed to look like an early 90s cartoon, and I haven’t seen any cartoons from back then that purposely sprinkled their visuals with pixels. Removing them is therefore moving the visuals closer to what they were intended to be in the first place, and while it looks a bit weird to begin with you quickly get used to it. Yes, it does bear more than a passing resemblance to a Flash cartoon now, but that’s the point. And yes, if you have an existing copy of DOTT ScummVM and DOSbox will automatically do a similar smoothing for you without having to pay £11 for a remastered copy, but it doesn’t look anywhere near as good as the work that’s been done here. The key thing is that it’s still recognisably DOTT, and the only real shortcoming of this approach is that the original animation frames have been preserved and look a little rough and jarring when everything else has been smoothed out. Doubtless this is to make it a little easier for the now obligatory F1 switch that flips between the classic and remastered versions of DOTT on the fly, so even if you really hate all of the changes you can still enjoy the original game in all of its SCUMMy glory. That’s about it for the remaster; there’s a bundled developer commentary that I haven’t listened to and a bunch of concept art that’s basically “Here’s what all of the backgrounds looked like before we put them in game”, but as far as the actual game goes the changes are pretty subtle and hands-off as I said earlier. As for DOTT itself, I’m not going to waste your time or mine explaining it; it’s a twenty-three year old game that you’re probably aware of if you have any interest in the medium, and if you aren’t aware of it then I would urge you to try it out ASAP. I wrote a little skit on it a few years back and as far as I am concerned it is pretty much timeless — something that no doubt has ensured this remaster’s high level of quality, as there wasn’t actually a huge amount that Double Fine needed to do here to remaster it in the first place. As with Grim Fandango they’ve shown a rare awareness that they don’t need to make changes for the sake of it, and have instead let the game speak for itself by only doing what is necessary to update it for the 21st century. In Grim Fandango’s case I found what it had to say incredibly annoying, but it gives DOTT a second chance to shine. And I’m all for that.